Posted by utechalumni in Alumni Events, Alumni Relations Office, UTech Events, UTech News, UTechJa Fundraising. Dear Alumni of the University of Technology, Jamaica (UTech, Jamaica). Perhaps you have thought of giving back to your University, but didn’t know how to go about it? We have several monetary and non-monetary opportunities for you to provide tangible support for the benefit of your Alma Mater. Please see below for some ideas on how you may give back to your University. It is not an exhaustive list and you are encouraged to discuss with us other ideas you may have to provide support to UTech, Jamaica. CURIOUS ABOUT WHAT’S HAPPENING AT YOUR ALMA MATER? Posted by utechalumni in Alumni Events, Alumni Relations Office, Uncategorized. Would you feel more hopeful if you had someone to help you develop a job search or career management strategy so you could get on with your life…with better fit between who you are and what you do, plus better compensation-focus-joy-peace? Would it mean a lot to you to be able to handle this…wait…period [wait to find a job, or wait to find a better job] without feeling fearful, angry, anxious and uncertain? Posted by utechalumni in UTech News. While the 36,315 enumerated voters in Portland Eastern were enduring the campaigning for their votes and deciding who to vote for from two mostly indistinguishable political parties, as far as policies, plans and programmes are concerned, or not to vote at all, I signed a petition. Posted by utechalumni in Professional Development, Scholarships. The Scholarships and Assistance Unit, Public Service Establishment Division, manages the GOJ Civil Service Training Programme and acts as Point of Contact for the various donor Agencies and Countries offering technical assistance to the Government under bilateral and multilateral agreements. In this regard, this office is responsible for disseminating information on training and study opportunities as they become available. For all the courses, unless otherwise stated, application forms are available at this office. Click Here To Review the Latest Scholarship Offers! Posted by utechalumni in Alumni Events, UTech Courses, UTech News. The UTech, Ja Alumni community held a lyme yesterday evening at the Jamaica National Building on Belmont Road. Members of the Executive of the Alumni Association were present, including the President, Mr Ronnie Sutherland, as were two members of the UTech, Ja Foundation (chaired by Eric Crawford). The University of Technology, Jamaica Academic Staff Union (UTASU) joins the debate about the viability of the national university and the unique and vital contribution it must make if Jamaicans from all walks of life are to be empowered with skills to excel in the 21st century and create the nation we all deserve and desire. Much has been achieved in the past, but the university must be properly funded and resourced to continue to excel in teaching, service and research. A major issue which hampers the university’s ability to better serve the needs of its main stakeholders — students — is the annual per capita subvention from the Government of Jamaica. Posted by utechalumni in Alumni Events, UTech Events. The University of Technology, Jamaica Accounting Seminar specially invites you to participate in our annual Mock Interview Series which will be held on Monday, April 1 to Friday, April 12, 2019 from 9:00 a.m. – 4:00 p.m.
Posted by utechalumni in UTech Events, UTech News. Posted by utechalumni in NEWS!. 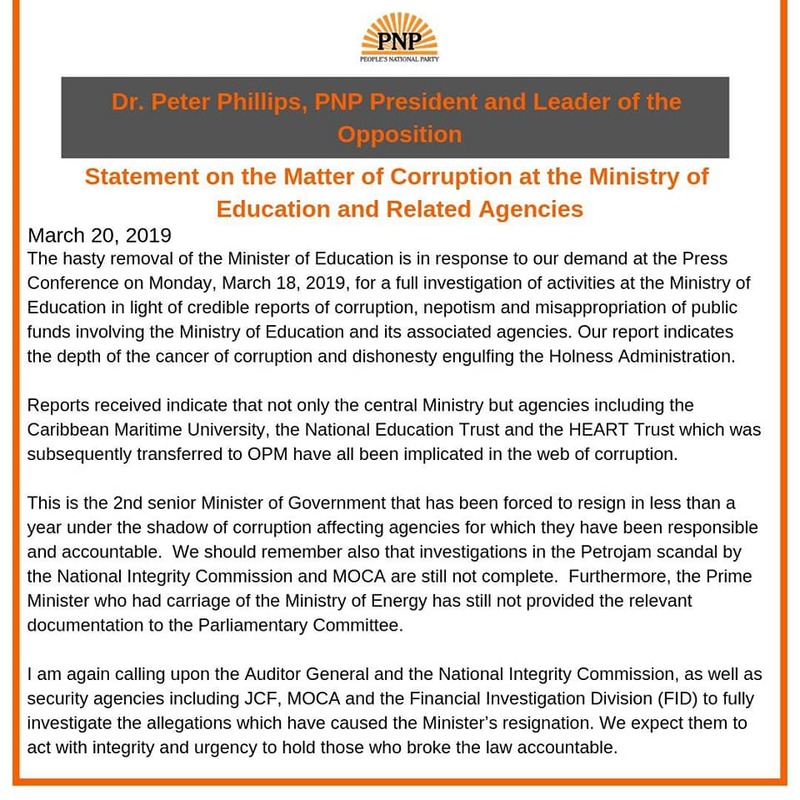 Here’s the latest on the resignation of Sen. the Hon Ruel Reid, Minister of Education, Youth and Information. We take particular note of these developments because the Ministry of Education, Youth and Information (MOEYI) is the parent ministry of our national university–University of Technology, Jamaica. In addition, we will watch this matter keenly because the University has once again been placed in *wait mode on the matter of whether the Government will act justly and increase the subvention to our national university, commensurate with need. ….It is a story I knew as a columnist in conversations with Dr Sangster long before going to UTech. And a story that continues to today. Posted by utechalumni in Alumni Assn UTech, Alumni Relations Office, UTech News. Posted by utechalumni in Testimonials - I Am UTech, Jamaica. Calling Alumni, Staff-Alumni, and Staff who are graduates from other institutions. As members of our UTech Knights Community, you are all invited to join us in honouring the University of Technology, Jamaica by sharing with the public the University’s positive impact on your life and that of Jamaica, the Caribbean and the world. The Management Division of the High Commission of Canada (HCC) invites applications from suitably qualified persons to fill the vacant full-time position of Senior International Business Development Assistant. provide administrative services to the IBD section. Posted by utechalumni in Alumni Events, DONATIONS, UTech Events. Imagine being the first in your family to go to college, being away from home and somewhat maturing in a strange environment. Imagine being from a needy family, that has spent all they had to help you through your university days, and they have no more to give? Where would you go for help? What if you were from a family that “dressing up” was not a routine and you simply lack both the knowledge and the means to do so? If after spending four years in college in a struggling economy a job opportunity presented itself, would you want to be dressed properly to make a strong first impression? Our final year male students would. Posted by utechalumni in Alumni News, Alumni Relations Office, UTech Courses, UTech News. You may recall earlier discussions concerning the significance of institutional accreditation for persons who graduated from the University of Technology, Jamaica prior to the effective date of institutional accreditation in February 2018.